Barcelona is the second largest city in Spain and it is the capital of Catalonia. Barcelona has approximately 1.6 milion residents. The city is located on the coast of the Mediterranean sea and at the other side it is surrounded by hills. In Catalonia they speak Catalan and Spanish but most people in the city speak English. The weather in Barcelona is very nice, it barely rains. Is full of life and ambiance. It is a nice environment to live in with a big history. Barcelona is subdivided in 13 districts where you can find lots of modern and Art Nouveau architecture. 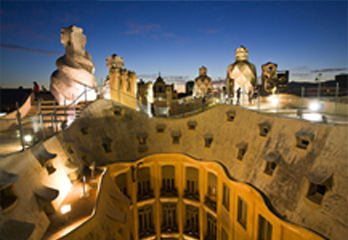 The most popular architect that left his signature in Barcelona is Antoni Gaudí. You can find his work in the beautiful Park Güell and the Sagrada Famí­lia is also one of his masterpieces. In the centre of Barcelona you can also find beautiful buildings that were built in the medieval times. Traffic is regulated by the city and the county itself. Traffic signs are in Catalan language. You can go for a walk to the Ramblas. This long shopping street divides the city in 2 parts: from the major traffic intersection at the edge of the city all the way to the Mediterranean sea. Barcelona is also a perfect city for cyclists. The wide boulevards and flat streets make sure you can discover the city perfectly. When there are bike paths, they should be used, otherwise you will cycle on the freeway. Barcelona has a 2 mile coastal line just outside the city, where you can take a dive in the mediterannean sea. You're more of a shopper? : Then Barcelona is the place to be. Miles of shopping streets with lots of shops will make sure you succeed during your shopping spree.